Cheap price 100w car power inverter for sale, charging via cigarette lighter, 12v DC to 110v/120v, 220v/240v AC power supplies, good for traveling while out of power grid source. 100w power inverter for car 12v to 110v, 120v etc. for charging small size home electronic devices. Tips: What is the efficiency of a car power inverter? A power inverter is an electronic device for converting 12v DC to 110v AC (120v, 220v, 230v, 240v etc.). The power inverter work on car will consume a part of energy, hence the input power is higher than its output power. The efficiency is the ratio of the car inverter input power and output power. E.g. a car power inverter inputs 100 watt 12v DC power and outputs 110v 90 watts AC power, then the efficiency is 90%. 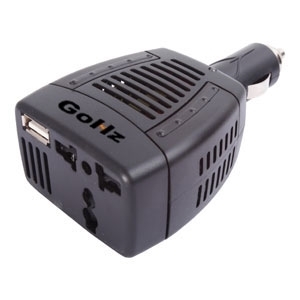 For a 100w power inverter, we can connect it to the cigarette lighter socket directly to charge 110v AC (120v, 220v, 240v etc.) devices; For the appliances power higher than 100 watt, connect a car power inverter higher than 100 watt to the 12v batteries via alligator clips, red wire to the positive pole of the battery pack, black wire to the battery negative pole (DO NOT reversed).